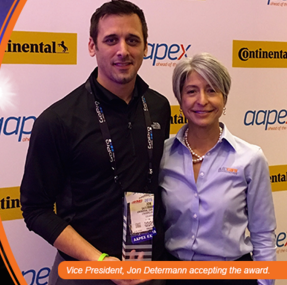 Las Vegas, NV USA: Universal Car Keys was voted “Best New Product” at the 2015 Automotive Aftemarket Product Expo (AAPEX) in Las Vegas. AAPEX is North America's largest international automotive aftrmarket trade fair. AAPEX reresents the $477 billion global aftermarket auto parts industry, and attracts over 140,000 automotive professionals each year. A panel of AAPEX buyers determined the winning entries at the event’s general session. “We’re glad we did as well as we hoped. There were hundreds of great products competing, but the Uniersal Car Key is such a unique and special product­­ we knew it would be a hit. We’re glad the AAPEX panel of reorganized our unique value proposition. The world's first Universal Car Keys and Universal Car Remtes bring automotive key replacement back into the hands of retailers and repair professionals--­­something that’s been absent for decades.” said Mark Lanwehr, President, Solid Keys USA.